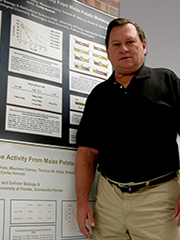 Curt Hannah studies the molecular genetics of starch production in corn. He is particularly interested in genetic mutations that change the size, shape and texture of corn seed. Hannah has been active in a long-term UF research project to understand how genes control development of corn and other cereal grains — the source of about 90 percent of the world’s food supply. By understanding the genetic basis for many traits of corn, including disease and insect susceptibility, biochemical composition and nutritive value, breeders will be able to use genetic tests and markers to identify subtle but desirable traits in crops more readily. Corn plants contain more than 40,000 genes, and researchers want to learn more about the subset of those 40,000 genes that are important to agriculture, particularly from the standpoint of plant growth, metabolism, disease resistance and crop yield. Hannah has received more than $12 million to support his research from the National Science Foundation and the U.S. Department of Agriculture. Results from his research have been published in prestigious journals such as Proceedings of the National Academy of Sciences, Plant Cell, Plant Journal, and Plant Physiology. Hannah has been awarded 14 patents and his work has been licensed to six of the leading plant biotechnology and breeding companies.